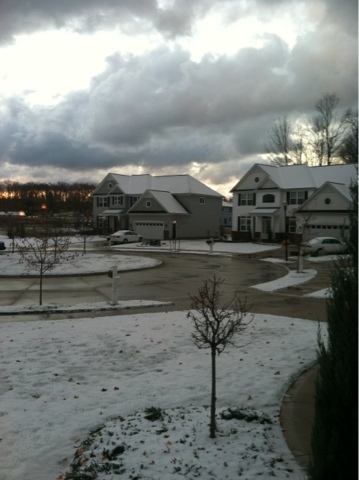 The Suburban Style Life: First Snowfall of the Year! First Snowfall of the Year! This morning I woke up to the first snowfall of the year!!! It actually was a bit of a wild and windy night that brought the snow, I was woken up to what they call "thunder snow". Have you all ever heard of it? It's when it is snowing and thundering. A bit of a wild phenomenon that doesn't happen too often. I was really hoping it would 't wake up Jillian, we were all in bed earlier than usual last night and was really looking forward to a good night sleep in our house! Luckily, Jillian slept through it and I fell right back to sleep. Winter is here!! Have you had your first snowfall yet? I bet this date won't be hard to remember when somebody asks the first snow fall of 2011.. 11/11/11 huh? Glad it didn't wake baby Up. Yestarday I watched her Trick or Treat video.. ADORABLE! Oh my gosh, you beat us in MN! I have to say I actually get really excited each year for the first snowfal, must be the kid in me! We had our first snowfall on October 27 in Texas!! I loved it! The snow looks so pretty! What a way to jump start the holiday season. We had our first snow in KS Monday night. Didn't last long, though- it was gone as soon as the sun came up! So pretty! I haven't heard of thunder snow. I bet that's really neat. We're back in the 70's today!